Rotary Club of Fair Oaks president Bruce Vincent (right) offers guest speaker Dr. Ron Chambers (left) a thank you gift for educating Rotary members about the issue of human trafficking. 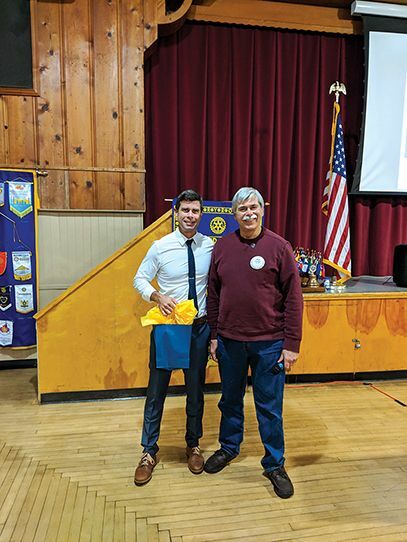 FAIR OAKS, CA (MPG) - Clubs throughout the local Rotary District 5180 are funding an education and public awareness campaign to combat human trafficking in the Sacramento region. As part of District 5180, Rotary Club of Fair Oaks is supporting this important project. In an effort to better understand the scope of the problem, they welcomed Dr. Ron Chambers as a guest speaker to their meeting on December 10. Dr. Chambers is a family physician who is involved in the District 5180 project to combat human trafficking. Dr. Chambers practices through Dignity Health and is the medical director for Mercy Human Trafficking Clinic, a medical safe haven for victims of human trafficking. In 2014, Dignity Health launched a program to identify victims of human trafficking when they are treated in the healthcare system. This program focuses on victim-centered, trauma-informed care. Every staff member of Mercy Human Trafficking Clinic is trained to identify and respond to signs that a patient has been trafficked. All the doctors, nurses, administrators, and janitors undergo this training. Dr. Chambers explained that most trafficking victims are treated by healthcare professionals during the time of their abuse, but most are not identified. Dr. Chambers shared a story about one of his current patients, an 18-year-old trafficking victim with a 5-year-olf daughter. The notes in this patient’s chart show that she delivered her daughter in a Dignity Health hospital and that the signs of trafficking were noted but not recognized. She was not identified as a victim at that time. But with the new protocol, “We don’t miss these [signs] anymore,” said Dr. Chambers. Dr. Chambers explained that the goal of the Mercy Human Trafficking Clinic is to create protocols that can be implemented in healthcare programs across the country. Each year in the United States approximately 1.7 million children run away from home, and only 21% are reported missing by their parents or caregivers. “So for the majority of these kids, the people who are supposed to love and care for them don’t even bother to report them missing,” said Dr. Chambers. They are running away from homes of abuse and neglect, and they end up on the streets. Dr. Chambers explained that the traffickers know where to look for these kids. They give them a place to stay, buy them food and clothes, and make them feel special. Once they’ve gained the victim’s trust, they beat her up, strip her, and then dump her on the side of the road in the cold. Hours later, the trafficker comes back for her; he buys her dinner, gets her a new dress, and takes care of her. Medical professionals refer to this ongoing cycle of reward and punishment as trauma bonding. This traumatic process creates powerful emotional bonds that are extremely resistant to change, which is why the majority of victims who are rescued will return to their abuser up to seven times.